The challenge of how to create opera in the twentieth century took composers in numerous directions. For Berg, a new, complex harmonic organisation was the way forward, while Puccini and Strauss constantly struggled to move beyond their inherited high Romantic musical language, and the stasis of Debussy's Impressionist project arguably conflicted with the dramatic elements of the genre. 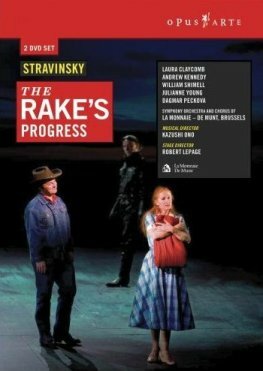 But Stravinsky looked to the eighteenth century for musical inspiration for his operatic masterpiece The Rake's Progress, and in so doing showed that a light touch could provide a unique sort of operatic irony which suited the historic context in which the work was premiered in 1951. Robert Lepage's extraordinary production of the piece was unveiled in April 2007 at La Monnaie, Brussels, and is due to come to Covent Garden in July. The cast will be almost entirely different, however, and I'm glad that Opus Arte chose to film the Brussels singers, most of whom couldn't be bettered. The year is barely two days old but this DVD promises to be one of the best of 2008: it is both musically and dramatically riveting and makes as strong a case for the opera as you could hope to encounter. 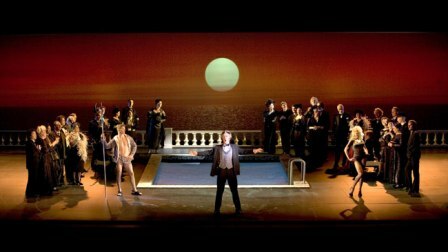 Lepage shifts the opera's setting from the eighteenth-century of WH Auden's original libretto (and the Hogarth prints which inspired it) to the 1950s America with which Stravinsky might have been familiar. On paper the idea disturbed me, but the translation proves to be utterly enthralling. At the beginning we see Tom Rakewell and his fiancée Anne Trulove in a quaint farm setting which resembles Oklahoma!. This idyll is thrillingly juxtaposed with visions of Las Vegas and Hollywood, which provide the backdrop for Tom's increasingly dissolute adventures. Carl Fillion's sets have a cinematic opulence and breathtaking imagination to them. Anne drives a car through wind and turbulence to try to get Tom back; she discovers him outside a cinema where crowds are gathered to watch a film premiere in which he stars with his wife, Baba the Turk; the trick 'bread machine' which Nick Shadow (the Devil) persuades Tom to market to people becomes a television in this production; the auction takes place beside a Hollywood swimming pool. The artifice of the worlds of television and cinema is a chilling contrast to the representation of the pastoral at the beginning, while the fast-moving plot is well served by swift scene changes and a hi-tech production (which must have cost a fortune). The opera is at bottom a retelling of the Faust story and charts how the Devil seduces the innocent Tom Rakewell down a helter-skelter of debauchery, leading to his death in a lunatic asylum. Lepage's production moves at a speed suitable to this journey. Every bit his equal, Laura Claycomb ensures that Anne Trulove is a character of grit and determination, as well as one of feeling. Her aria at the close of the first act is a coloratura masterclass, but it's the sadness and poignancy of her farewell to Tom which sticks in the memory. William Shimell generates a sinister edge for Nick Shadow through understated acting and singing: he's a truly shadowy, creepy figure, rather than a stock villain, and the curse he places on Rakewell to turn him mad is all the more powerful for the restraint he practices earlier on. Darren Jeffery's secure tone and dignified posture make him a strong paternal figure as Father Trulove, Dagmas Peckova's Baba the Turk is striking in the scenes about her rejection by Tom, and Julianne Young's strongly sung Mother Goose completes an excellent cast. The Rake's Progress is rightly identified as a Neoclassical work, employing a cembalo for the recitatives and using clear, classical textures for much of the vocal writing. Kazushi Ono's conducting of the Symphony Orchestra and Chorus of La Monnaie shows a pronounced understanding of this element of the score, ensuring the accents and rhythms are sharp and the dynamics carefully tailored. But for me, Ono brings out colours in this work I've scarcely noticed before, especially in the bleak asylum scene, which sounds utterly modern against the return to overt classicism in the epilogue. This is in every way a commendable release and, despite the modern setting, an excellent introduction to the opera for those who don't know it. I can't wait for it to come to Covent Garden.